Thanks to a tweet from Jay Cross, I took notice of the Power Searching course from Google lead by Daniel Russell, the Senior Research Scientist from Google, Inc. 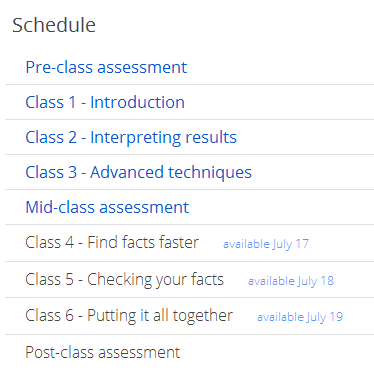 The course started three days ago on the 10 July and will end on July 23, 2012. You cans till sign up until 16 July, 2012. 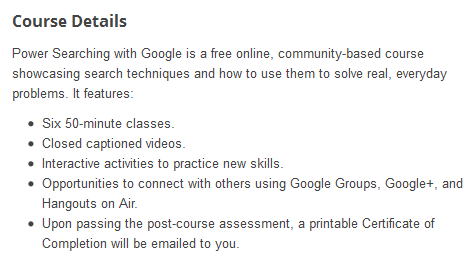 So why taking a search course with Google? Don’t we all think, that doing a web search is a walk in the park. You just type in the search box what you want to find, hit the Enter button and you get the result you want. Well, that is at least the theory, but in practice it looks quite different. Sure Google and other search machines improved their service to make searching the web fool-proof, but if you want to become more professional in your web search I recommend to take that course. No I am not paid to say that, and I considered myself quite expert in finding information on the web. However, in some cases I hit the wall and/or it was quite time-consuming. Therefore I thought, well give it a try. Did you know what you have to type in the search box to get the result below? Or did you know that Google even works as a calculator! I just finished the first class and though some search tips where familiar to me, e.g. to filter image results by color or how search works, finding text on a web page was new to me. Or did you know that “command + F” (Mac) or “CTRL + F” (PC) opens an extra search box within your browser, that allows you to type in keywords you want to find on the website. It is similar to the search option in a PDF document. Very effective and helps you to save a lot of time instead of scanning the whole page to find the tiny information. Below the schedule with the different classes. Hi there, simply changed into aware of your blog via Google, and located that it is really informative. I’m going to be careful for brussels. I will appreciate if you continue this in future. Numerous other people can be benefited out of your writing. Cheers!